UFC London took place this past weekend and to say that it ended with a bang would be putting it mildly. Even after the main event concluded, the action didn’t quite stop. In said main event, ‘Gamebred’ Jorge Masvidal would return to the Octagon for the first time since November 2017 as he hoped to snap a two-fight losing streak against Darren Till. And that he would. Masvidal would score the knockout victory in just the second round over the Brit before colliding with another backstage. 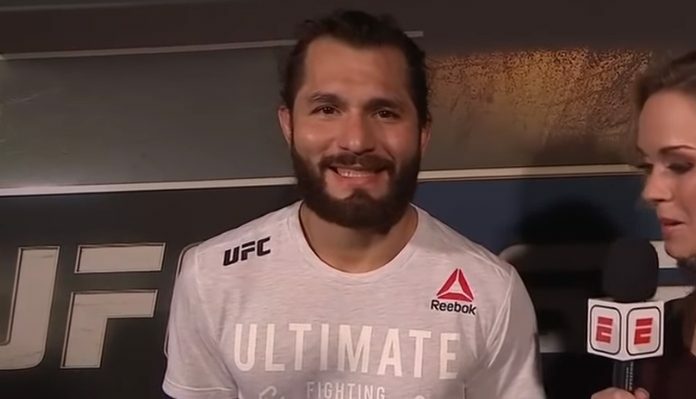 While being interviewed by UFC correspondent, Laura Sanko, Masvidal would find himself verbally antagonized from across the room by co-main event winner, Leon ‘Rocky’ Edwards. This, of course, did not sit well with Masvidal who would walk over to Edwards and light him up with a couple of punches before they were separated. As one might imagine, repercussions from the athletic commission as well as the UFC could have followed. However, there has been no word of anything yet but as for the UFC’s end of things, UFC President Dana White says there will be no punishment for the event’s big winner. “I do blame my staff,” White told Yahoo! Sports when speaking of the incident. “There’s never a scenario where you let guys walk up to each other like that backstage. We have enough people backstage that, that shouldn’t happen, including security. I’m super disappointed in my whole crew for that one. These guys are fighters, they’re in the heat of the moment, he just won, he’s got the adrenaline pumping and [Edwards] comes by plus Masvidal is ‘that guy’. This wasn’t the first time that we’ve seen altercations outside of the cage between fighters. Whether it be between Jon Jones and Daniel Cormier or Conor McGregor and Khabib Nurmagomedov, it’s just one of those things that comes with such an intense sport. Edwards vs Masvidal has now seemingly set itself up after UFC London. But should it end up happening next?